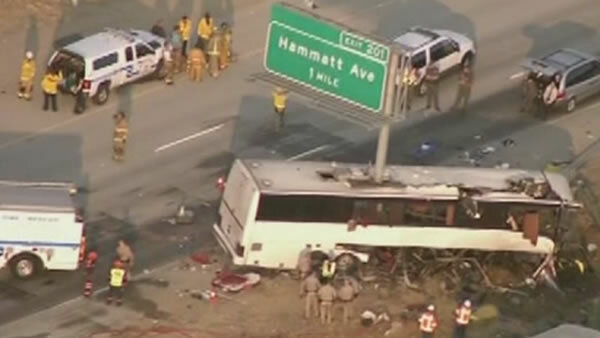 MERCED COUNTY, Calif. (KGO) -- Experts from the National Transportation Safety Board are investigating a bus crash that killed four people and injured 23 on a central California highway. Senior highway accident investigator Don Karol said Wednesday that it's not known what occurred immediately before Tuesday's crash and that the NTSB will be working with the California Highway Patrol to find out. The driver survived, but officials haven't been able to speak to him because of his injuries. Authorities say there were 27 people on the bus, including the driver. Besides the passengers who died, seven suffered major injuries, three had moderate injuries and 13 received minor injuries. Shortly after Tuesday's crash, a California Highway Patrol officer at the scene said five people died. The bus struck the pole of a road sign, and it tore through the seating area. The sheriff says there were dismemberments. Officials say the dead include a married couple from Mexico who were traveling to visit a daughter in Pasco, Washington, and a man from Avalon, California, whose spouse is hospitalized. A fourth victim is only identified as a man in his late 30s whose family is being sought through a Mexican consulate.